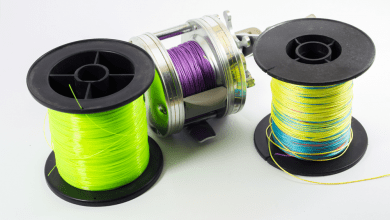 You spend a lot of time out on the water, and while you might be tempted to try and save a few bucks by lugging around your heavy tackle box, this is simply not an option for many anglers. 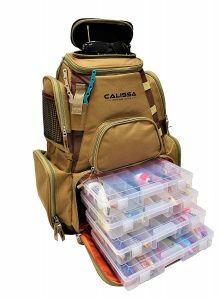 If you want to explore rugged backwoods rivers or hike up into mountain ponds, your tackle box needs to be portable and easy to carry with you on any adventure. More importantly, you need a tackle box that will serve double duty, making it easier for you to focus on the task at hand – landing monster fish. 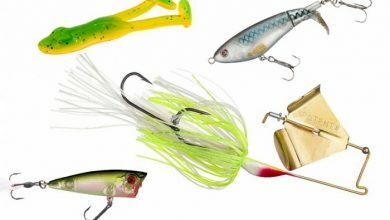 You want your tackle box to protect your lures and flies without having to worry about damaging them while in transport. A fishing trip is a hallowed time for you to enjoy the peace and quiet of nature. 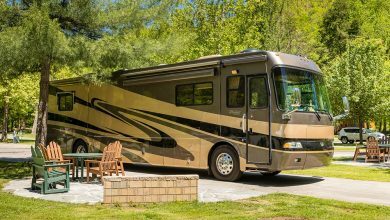 Don’t spend another second worrying about how you’re going to haul all the gear associated with this laidback hobby. Instead, consider one of these fishing backpacks. 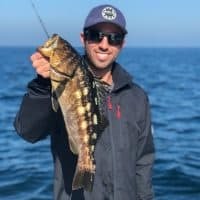 Why Do You Need a Fishing Backpack? A fishing backpack will help protect your lures, rods, and reels, and also help transport other items you might need on a longer hike. 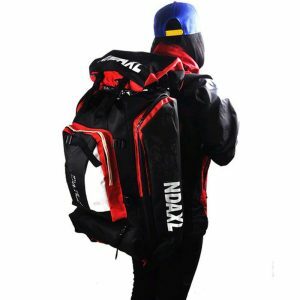 Search for a backpack that allows you to store other items, like food, water, or extra clothing, or one that has extra straps for things like nets and tents. Most importantly, fishing backpacks can serve double duty. Many people use their backpacks for hiking, camping, boating, or even at work. Some of the more rugged options on the market contain tool straps so that you can use them on a construction job site. If you invest in a high-quality, waterproof backpack that is made with durable materials, the opportunities are virtually endless. 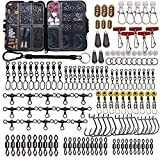 You need a fishing backpack if you spend any amount of time out on the water, or have begun to accumulate a vast collection of fishing accessories. Shore fisherman, as well as those using flies or fishing in the backcountry, can all benefit from purchasing a fishing backpack. 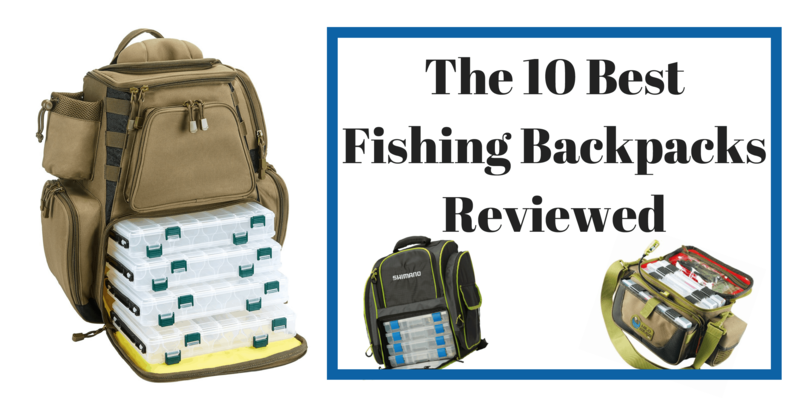 What Should I Look For in a Fishing Tackle Backpack? Don’t be lured in (pun intended) by backpacks that offer more features than you think you need – think carefully about your specific goals and consider these backpacks in your quest for the perfect match. 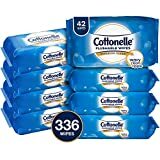 The main feature you want to consider is how much storage the bag provides. Think about both tray and gear storage. How many utility boxes will this backpack accommodate? What about the extras, like sandwiches or sweatshirts. Also, think about how much the backpack will weigh when fully loaded. Most manufacturers provide specifications on what the backpack weighs empty but consider how much it will be when it’s stuffed to the brim. 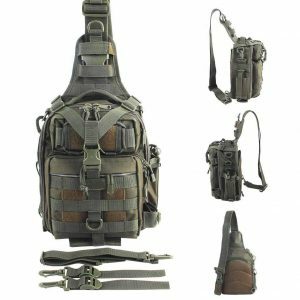 You also want to examine any other special features, like lights or extra pockets, as well as the quality of the pack’s materials. 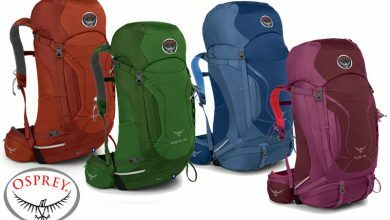 Check out the “Best Osprey Backpacks” that we reviewed. This tackle backpack is one of the most versatile options, offering you the ability to wear it as a backpack or sling, or to carry it as a duffel bag. This durable backpack is made out of water-resistant materials and comes equipped with tons of pockets for all of your storage needs. It has easy-to-grip handles and is lightweight, making it easy to carry to your fishing destination. This bag is also a great choice for hunters, climbers, or cyclists. The detachable strap makes it easy to carry on any outdoor adventure, and it has lengthened and widened shoulder pads to make it more comfortable on longer trips. This backpack has a lot in common with other Wild River backpacks like the Recon and Nomad (the latter of which is also included on this list) but it has fewer bells and whistles, making it a no-nonsense choice for somebody looking for their first fishing backpack. 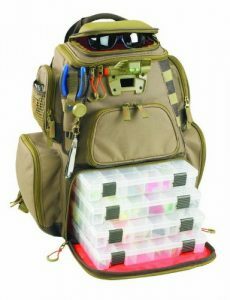 This bag comes in two sizes, with the larger holding up to four tackle boxes and the small holding two. While this bag doesn’t have any of the frills of more expensive options, it is made out of durable materials. For example, the bag has plastic zippers (no rust here) and has plenty of storage for all of your fishing needs. This backpack is one of the least expensive options on the list, and is a great value for someone looking for a high-quality, inexpensive fishing backpack. It has a conveniently located main compartment for any outdoor sport, including fishing, hiking, and even running, with a smaller front pouch that is ideal for items like cell phones or small tackle. 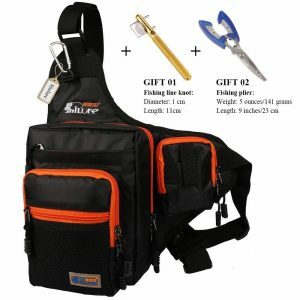 The bag also has an added bonus, providing customers with a free fishing plier tool with a hook remover, split ring pliers, knife blade, and more. 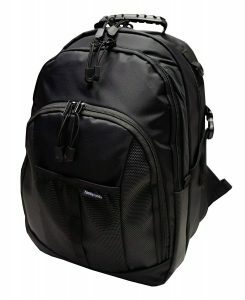 The bag is made out of a durable canvas material, with a canvas mesh back for better ventilation and increased comfort. A popular option for its hard molded sunglasses case, this bag is the only one on the list that markets itself as saltwater resistant. It includes four tackle trays to hold all of your paraphernalia and is designed in a functional, breathable way. This bag is used by fresh- and salt-water anglers alike, and can even be used out on the ice. Designed as one-size-fits-all, it can be used by men, women, and even teens. Wild River is one of the top names when it comes to tackle backpacks. 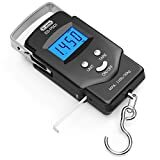 This is one of the larger varieties on the market, and is made out of high-quality materials, like waterproof nylon and rust-proof plastic zippers. 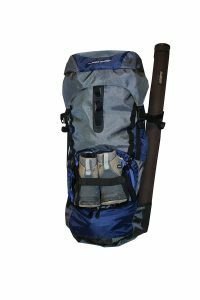 This is a heavier pack but comes equipped with a rigid, rubber-based bottom so that it can be stood up anywhere without spilling its contents all over the riverbank. 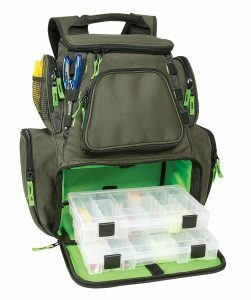 This backpack includes four utility boxes, as well as multiple tool holders for pliers and scissors. It even has a hard-sided sunglasses holder at the very top of the pack. The front pocket cover folds down to provide a convenient work surface for tying flies or rigging up, and the LED lighting system will help you make sure you don’t accidentally hook yourself while doing it. This is also one of the most water-resistant packs, with a built-in rain fly to help deflect rain in a torrential downpour. You might already be familiar with Spiderwire’s award-winning braided fishing line and polarized sunglasses, but one of this company’s hidden gems is its awesome tackle backpack. 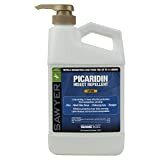 This is one of the best-selling items on the list, and comes equipped with the trademark Spiderwire logo and design. But this backpack is more than just a flashy design. It is made out of all-black nylon and polyester, with a handy fishing rod carry system. 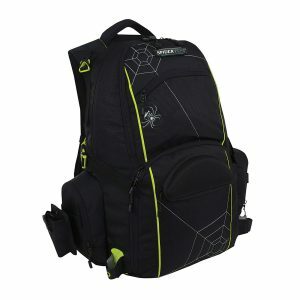 It has thick shoulder straps and a waist strap to support longer treks into the woods, even with a heavy load to carry. This backpack comes with three medium tackle trays, and even has a unique cooler compartment where you can stash worms, snacks, or other cold items. As an added bonus, it also has a foam molded sunglasses case with a soft lining, to prevent your lenses from becoming crushed as you move. This backpack is both lightweight and versatile, and is often purchased by hunters and hikers as a year-round option. It sports multiple pockets for tools and accessories, and has a large main compartment to store any larger gear. It also has a separate insulated section to store your hydration reservoir or even a cool lunch. As an added bonus, it comes equipped with a two-stage knife sharpener, so you never have to worry about your knife dulling in the middle of a fillet. This backpack is the only one on this list that has the flexibility and versatility of a backpack, but the comfort and style of a vest. It comes with two primary pockets (molded for comfort) to hold your flies, with three zippered compartments for the rest of your gear. All compartments are expandable, and the backpack is water-resistant and lined with mesh to keep you cool, dry, and comfortable. This bag has received top marks, combining the storage space of a traditional backpack with the comfort of a vest. It comes with both hip and shoulders traps to allow for greater weight distribution, and has a large inner pocket for extra storage. This convenient little backpack is different than normal backpacks in that it offers all of the benefits of a hiking bag, but is also a great choice for anglers. 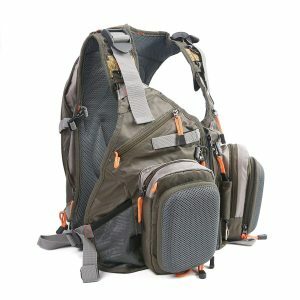 It has tons of room for gear, reels, and even a hydration system’s bladder, and even has a compartment for wading boots. It also has an attachment for a changing mat and a spot to hold your waders. This backpack has plenty of room for all your gear, and even has space to slide a small bagged lunch. The material is flexible, allowing you to stretch the bag to its maximum capacity. This backpack is really in its own league, in that it is more of a duffle bag (as the name suggests) than a backpack. It has more space than any other bag on this list, offering a number of sizes ranging up to XXL. With six pockets, this backpack offers plenty of storage for all of your gear, and even offers a front pocket cover that can fold down to create a work surface. This bag is water-resistant and is made out of acid- and heat- resistant fabric. This bag also has two long side pockets to hold rods, as well as a mesh bag that is designed to hold a water bottle. Feeling overwhelmed by the options yet? Don’t! Each of these backpacks is a great choice, depending on your personal preferences, style, and fishing plans. Our pick for the most versatile backpack has to be the Wild River Nomad. 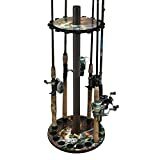 As our top recommendation, it has the greatest tackle and weight capacity, and provides a comfortable way for you to carry all of your fishing accouterments through the woods. That being said, other backpacks might suffice for short trips, or for fishing from riverbanks or near the road. Select the backpack that works best for your plans, and don’t waste any more time – get out there on the water!